The Citizens Coinage Advisory Committee (CCAC) met on November 27, 2012, at United States Mint Headquarters, to review and discuss designs for the 2013 American Platinum Eagle reverse designs. In attendance were Chairman Gary Marks, Dr. Michael Bugeja, Robert Hoge, Erik Jansen, Michael Moran, Michael Olson, Michael Ross, Jeanne Stevens-Sollman, and Thomas Uram, as was Don Everhart, Ron Harrigal, Bill Norton, and Greg Weinman from the U.S. Mint. 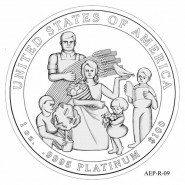 Sculptor-engravers Renata Gordon, Phebe and Joe Menna were video-conferenced in from the Philadelphia Mint, and Ms. Wastweet was voice-conferenced; all others attended in person. 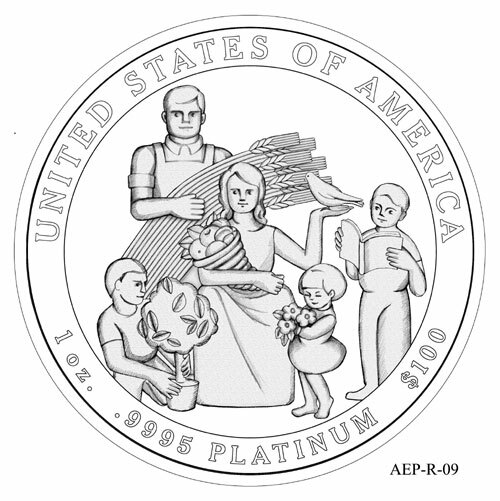 The 2013 designs, continuing on the theme that started in 2009 of presenting phrases from the Preamble of the Constitution, embody “to promote the general welfare”. Mr. Harrigal described the 9 designs to the committee, accompanied by visuals. Michael Ross started the discussion, as the historian of the group, by noting that this year’s phrase appears in Article I, Section 8 of the Constitution itself, and caused a “titanic struggle” within President Washington’s cabinet between Alexander Hamilton, who saw it “as an empowering phrase that will allow the government to fund industries, to build a national bank, to build a mighty army”, and Thomas Jefferson, who believed it meant that the government “could only tax for things that everyone agreed was for the general welfare and not special interests like industry or banks or finance, et cetera.” The designs for this coin, Mr. Ross noted, are split between each man’s interpretation. Chairman Marks conducted the committee’s usual culling of the designs: only designs 1, 2, 3, 4, 5, and 7 will be considered for recommendation. 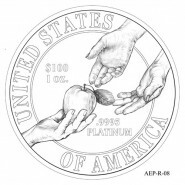 Mr. Hoge found that design 1 was a replay of items that have been depicted on United States coins in the past. He said that designs 2 and 3 had an “attractive backdrop”, design 4 was “a horrible thing”, and designs 5 and 6 were “extremely classical”. Mr. Uram was next, and leaned towards the Hamiltonian interpretation in designs 2 and 3; he favored design 3, possibly due to his being a Rotarian. Mr. Moran also liked design 3, especially the gears that, to him, “symbolize turning and progress”, but also liked the drafting in designs 2, 3, and 4. Mr. Jansen found that, as the coin at the top of the Mint’s product line, “it’s always a battle between classic and regal”. He broke ranks with the previous committee members, as he found the gears in design 3 to be “very industrial-looking” and in conflict with “the classic nature of the portrait”. He liked design 7, with its “symbology of being fruitful with two hands coming down”. Chairman Marks was next, and focused his comments on design 3. He praised the designer, calling it “absolutely gorgeous”. He acknowledged “the harshness between the elegance of the woman and the industrial-ness of the gears”, but saw it as “the visionary of the young country”. Ms. Wastweet followed, and agreed with, the chairman in liking design 3, commenting both on the “softness of Liberty versus the harsh gears” as well as “the interesting negative spaces”. She found design 2 “too obscure”, liked the symbology in design 1, but not the fact that you “really can’t see the nest”, found that design 4 did not communicate its message as well as design 3, and that, in design 5, “the Liberty looks like she’s keeping the cornucopia away from the eagle, and the eagle is not happy about that”. Mr. Olson continued the majority opinion in his preference for design 3. He didn’t “get the message” from design 1, although he found it to be a “nice design”, as was design 2, but it “doesn’t tell me anything about general welfare or promoting general welfare”. He found design 4 to be “creepy”, and didn’t like how the eagle on design 5 appeared to be a pet. 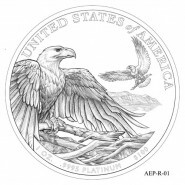 Ms. Stevens-Sollman agreed with the comments already made, and thought the eagle was “beautifully rendered”. Dr. Bugeja liked design 3 a lot, finding the gears to invoke the imagery of the internals of a timepiece. He also expressed that the “man sculpting a woman” grated him, “in keeping with the metaphor, the wrong way”. 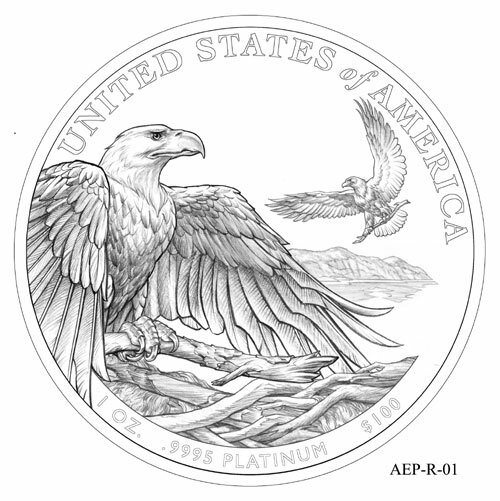 With 28 out of a possible 30 points, design 3 received the committee’s recommendation as the reverse design for the 2013 American Platinum Eagle. The Commission of Fine Arts had review the same design candidates at an earlier meeting. They had made a recommendation for design 2. Design 2 is better, but I guess the gears are in motion. 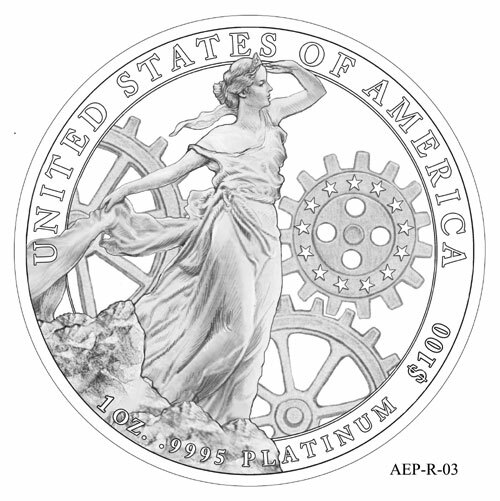 The reverse design should be Uncle Sam robbing a working person to give to a deadbeat…or perhaps Uncle Sam wearing a doctor’s garb pulling the life support plug on a patient laying in bed. Both design 2 and design 3 are excellent choices. I’ll be happy with either one. I disliked #4 and everything in the bottom row. Overall this seems like a fairly strong showing of designs. 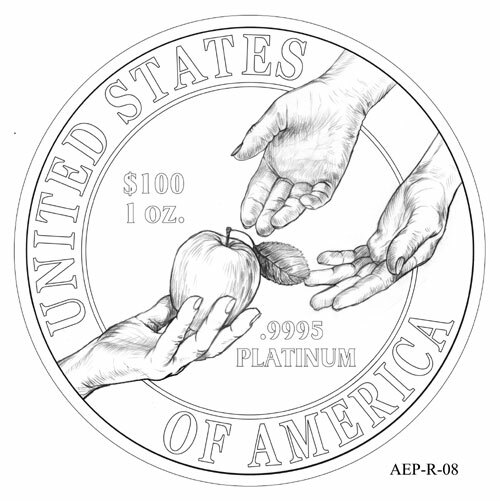 Hoping the Treasury Secretary picks Design #2 as did the Commission of Fine Arts. Design #3 has too much “design” & won’t look good on the actual coin. 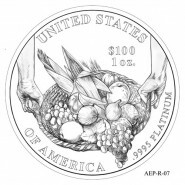 Just my humble opinion based on years of coin collecting. Forgot to mention the Fine Arts people also suggested eliminating the stars & horizon line. I also agree with that. Less is More & keep it simple – please. When will the Treasury secretary make his decision? Is there a deadline? I really like #2, #3, and even #4. 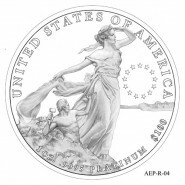 If he picks any of these, this coin, for me, will be one of the most beautiful modern coins ever struck, almost as nice as the gold ultra high relief (if the engraver faithfully follows the drawing). 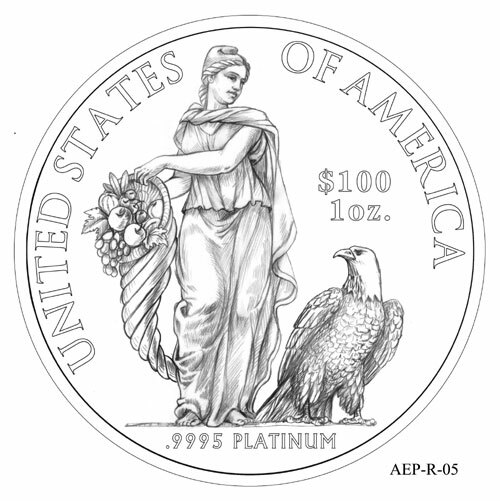 The 2011 platinum proof would have looked better if the female figure on the reverse had been more three dimensional or had more depth; she looks flat and plain to me. I too like the female figure in #2, #3 and #4, but I also think that the “sculptor” in #4 is “a horrible thing”, and to me #3 looks like her clothes are caught in the gears and she’s about to get sucked in to the machinery. I’m with POP. 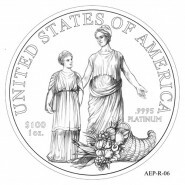 #3 would be a beautiful design for a 5 oz coin. But it has too much going on for a smaller coin. My problem with #2 is that nothing about it say “promote the general welfare” to me. 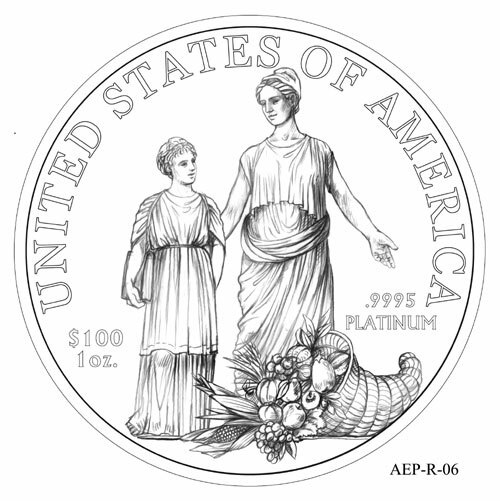 I would like to see that design modified to have Liberty holding a cornucopia. And I agree on eliminating the stars and horizon to create negative space. On #4 – I tend to visualize Liberty as a real person, not a statue. So that one looks to me like a miniature man attacking her. they should not have gears on the coin. the woman is soft, the gears is too hard, no good! like #2.